The Lewis Chessmen are currently separated into two places of residence. The British Museum in London is home to 67 of the chessmen and the Museum of Scotland is home to 11 of the chessmen. The two museums have temporarily loaned out a combined 30 pieces, as well as other artefacts, that are on a tour of Scottish museums. There is some controversy as to where the pieces rightfully belong: the British Museum or the Museum of Scotland. There is valid reasoning to each side of the debate in this concern. From an ownership standpoint the British Museum made an outright purchase of the pieces in their collection. The Museum of Scotland has their collection through outright donation. Each museum, therefore, has legal ownership over the pieces in their respective collections. The debate in this area does not contend with legal ownership but with the repatriation of historical artefacts. The question of where the Lewis Chessmen belong can be narrowed down to two opposing ideas: localised history and global history. These differing views can also be applied to the majority of museums across the world. 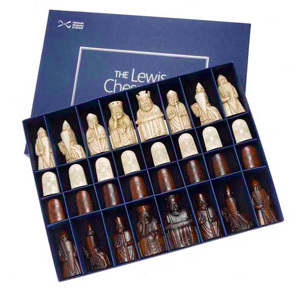 Some people believe that all of the Lewis Chessmen, those miniature expatriates, should be returned to Scotland and the rights to them should belong exclusively to the Museum of Scotland. The pieces constitute a major historical find and, as such a find, should be returned to the country in which they were discovered. Much of the dissension relates to the perceived inequity in the bulk of the pieces residing with the British Museum while the Museum of Scotland is only in possession of a mere sample of the whole. Other people believe that the chess pieces that are in the possession of the British Museum should stay where they are. These are the voices that speak out in favour of the pieces being a part of world history and that they still belong to the people of Scotland as they are displayed by the British Museum. Why do museums exist? That is a question that must be explored before any decisions to move historical findings are made. If museums are solely meant to be platforms for displaying localised items and the history surrounding them, the answer will lean one in one direction. If museums are meant to display pieces and the surrounding history for a global view of the past, the answer will lean in a different direction. Regardless of where the pieces reside, while government and museum officials debate this concern, the collection will always be a part of world history and is there for the world to view, discuss, debate and learn about the past. 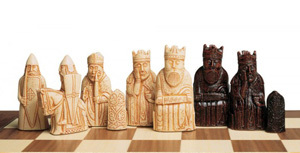 The interest generated by the Lewis Chessmen, whether it is a result of the unresolved questions or fascination with medieval history, has benefitted both museums in another fashion: Replicas of the chess sets are popular items sold by the museums. The mass reproduction of the Lewis Chessmen has evolved into a business in itself due to the high demand for replications of the pieces. Large portions of the world's population want to own a copy of this intriguing set and the interest extends beyond those that simply enjoy chess in itself. Reproductions of this set have the authenticity required by medieval re-creationists in their quest to relive history. A chess table that displays this unique set is a guaranteed conversation starter for people with an enjoyment of discussion and debate. This set is also collected by people drawn to the mysterious and unknown quality of history; people that enjoy gazing at the pieces and pondering the many "what if…" possibilities.